At the moment I'm making 3D design and 3D printing lessons for schools. A good idea that I'm exploring is the Paddle Wheel Boat. 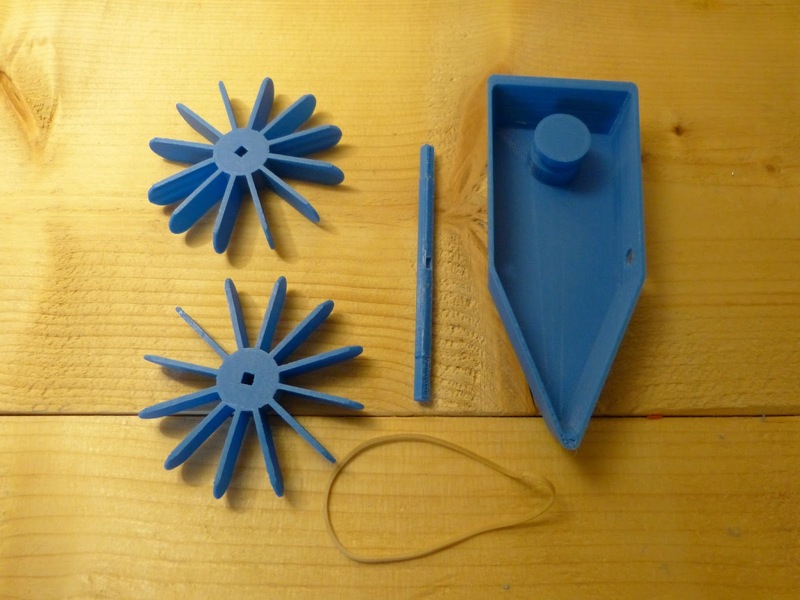 I found an example on Thingiverse, a rubber band powered boat with two peddle wheels, but it has two problems. First of all the author only provides .stl files and second the design is a bit flawed. 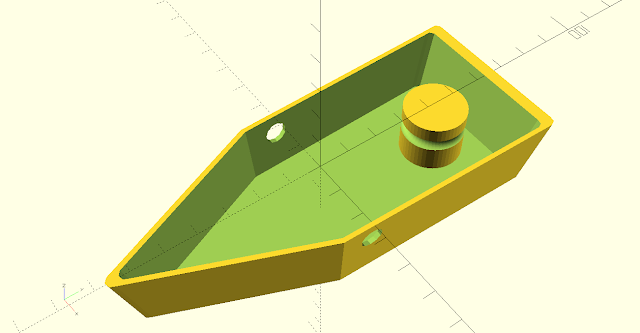 I therefore decided to design the boat from the ground up with OpenSCAD. With OpenSCAD I'm not only able to edit my models quickly, I'm also able to share the OpenSCAD script allowing other to use and change it. Links to the downloadable files can be found here: https://drive.google.com/drive/folders/0Bwg0RBbuN0fMQ3VUQUUycGJwZlk. 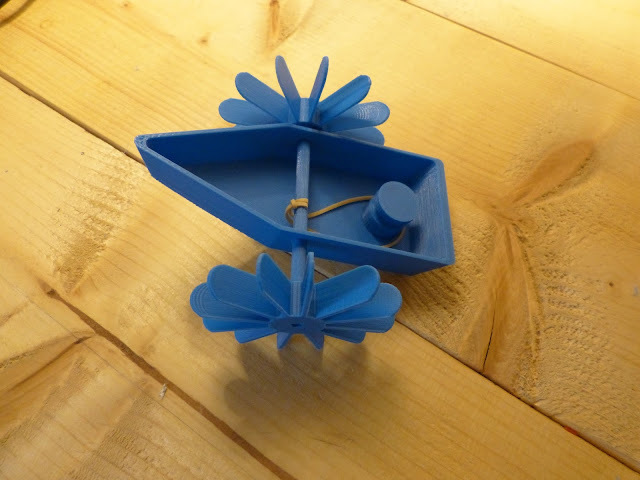 The Paddle Wheel Boat that I created consists of four parts: the boat, the shaft and two peddles. The main change of the boat that I designed is the position of the shaft. It's been shifted to the middle of the boat providing more balance. I also enforced the attachment point of the rubber band to the boat making it impossible to break it. The redesigned Paddle Wheel Boat with shifted positon of the shaft and enforced attachment point for the rubber band. I also increased the size of the paddles enabling the boat to move faster. The shape of the paddles are rounded instead of square improving the dynamics of the paddles through the water. A problem with the old design is that the rubber band has to be fixed to the shaft with some tape. Not a very elegant solution. 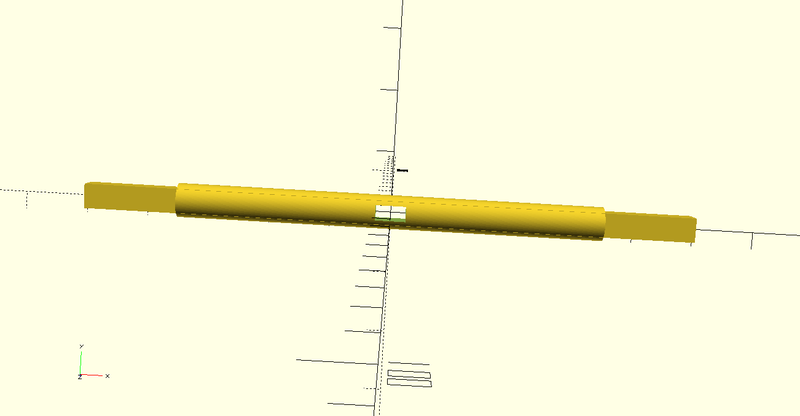 I added a square hole to the design of the shaft. The rubber band can be inserted through the hole and fixed to the shaft. No tape needed. Simple square hole in the shaft. The rubber band fits right through the hole making it easy to fix it to the shaft. Changes to the models are easily made. 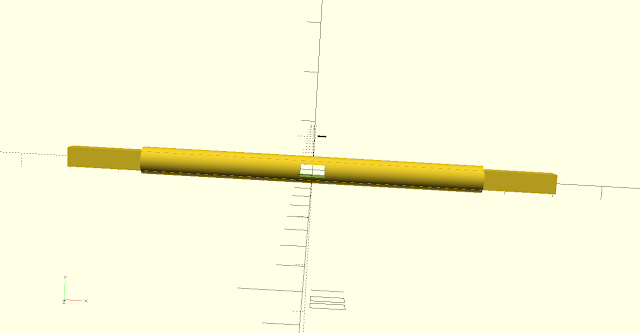 The OpenSCAD script is simple and the result of a change can be reviewed immediatly by pressing F5. E.g to move the shaft to the back of the boat can be achieved by just one simple change in the script. Peddle wheel loaded in Cura 2.3.1. Just four parts, the boat, shaft and two peddles, are needed to make the boat. If you don't want to make changes to the design just download the provided .stl files and open them in your favorite slicer. After printing the Peddle wheel boat can be assembled and tested. Have fun. All printed parts plus the rubber band.